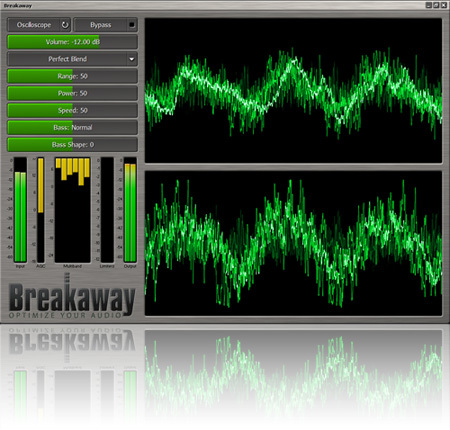 Breakaway Audio Enhancer dramatically improves the audio experience for all PC users with the same technology as pros in the music business use to clarify and control your computer audio. Breakaway Audio Enhancer provides complete audio control over music, videos, web browsers, and games. Screaming web ads impale speakers, Hulu videos require cranking the volume up, and every media player makes favorite CD’s sound different but Breakaway Audio Enhancer changes all that. Audio from any source sounds professionally mixed with the Audio Enhancer’s automatic adjustment of volume dynamics and equalization. Breakaway Audio Enhancer incorporates state-of-the-art dynamics processors that examines and adjusts the audio thousands of times per second. Low levels are intelligently raised and loud signals are kept under control. Audio in any media player or web browser, including MP3s, video, Internet radio, or CDs, will be digitally remastered for consistent volume level and spectral balance. Files are not scanned or modified - just improved in real-time before they hit your headphones or speakers. With Breakaway Audio Enhancer there is no longer a need to purchase separate audio enhancement plug-ins for each of your media players. 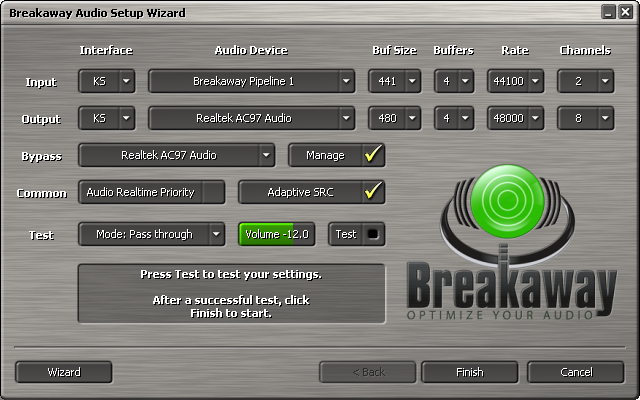 Breakaway Audio Enhancer will improve the audio for all Windows audio & video players. It is the gatekeeper for good sound between any digital audio player and your speakers. Only sweet sounds get out. 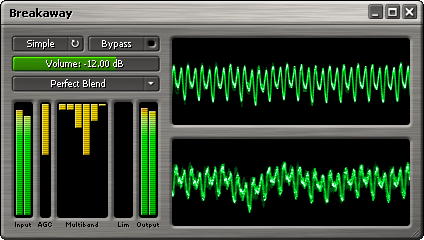 * Multi-band dynamics processing restores spectral balance to your music library. * Multiple look-ahead peak limiters provide distortion-free transient control. * Makes tunes sound louder and punchier, while bringing out subtleties you never knew existed. * Automatically adjusts volume dynamics and spectral balancing. * Corrects song-to-song volume shifts and overdriven speakers. * Same professional technology used by DJs, radio stations and webcasters. The easy to use audio wizard will guide you through the audio configuration procedure. The audio wizard is automatically run when you run the installer. Range: Controls how much Breakaway is allowed to increase the volume of quiet sounds. Power: Controls how much Breakaway is allowed to re-equalize the spectral balance (bass, mids, highs). Speed: Controls how quickly Breakaway will respond to changes in the audio. AGC: Indicates the current amount of gain (volume) being applied. AGC/Lim: Indicates the current re-equalizing being applied. Breakaway can be resized, docked to any screen edge, or added as a taskbar toolbar. Breakaway has an optional toolbar, to allow integration into your taskbar. To access it, right-click your taskbar, and select Toolbars - Breakaway. No Instrumentation, to allow easy volume control and bypass. Double-click mutes.